Trauma, the alluring diagnosis of the therapy profession. No other single condition tests the therapeutic relationship quite so stringently, demands so much from the clinician, or combines so many disparate treatment challenges in one messy package as the traumatized client. 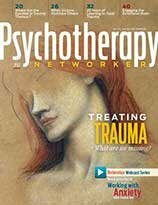 If we don’t open up the one-on-one therapeutic cloister, trauma sufferers may never learn how to engage in the give and take of real-life relationships. By failing to include their families, we too often fail to help them weave change into their daily lives. Most therapists find it relatively easy to feel empathy for the usual hyperaroused, vulnerable trauma client. But it can be a lot tougher to remain nonjudgmental and receptive with dissociative clients who’ve done horrible things to traumatize others. To get through to clients in our increasingly ADD culture, therapists must learn to evoke a deeper, more visceral engagement with them. At this year’s Networker Symposium, a lineup of innovators shared their wisdom about how to do just that. The increasing popularity of neurofeedback is based on the growing evidence that a wide variety of psychological disorders can be understood as firing mistakes in the brain’s electrical activity. Brain Imaging and Psychotherapy: Why is it so controversial? For nearly 20 years, psychiatrist Daniel Amen has led a controversial crusade to make brain imaging an accepted part of psychotherapeutic practice. The authors of a provocative new book argue that, despite its sterling reputation, alcoholics anonymous has one of the worst success rates in all of medicine. A middle-aged man explores his troubled relationship with the body his genetics have saddled him with.